1976 Alfa Romeo Giulia Diesel Owners Manual. 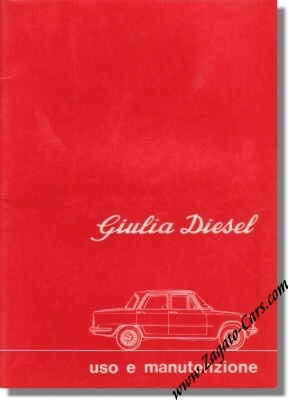 Vintage June 1976 owners manual for the Giulia Diesel. It measures some 6 x 8 inches or 15 x 20 cm and counts 44 pages and a fold-out electric wiring diagram. Print reference: N. 23432 - 6/76 - 10.000. The price includes shipping to any destination in the world.